In my relatively new position running a Balance Disorders program at a large teaching hospital, I am exposed to a very different patient population than what I encountered in my private practice. 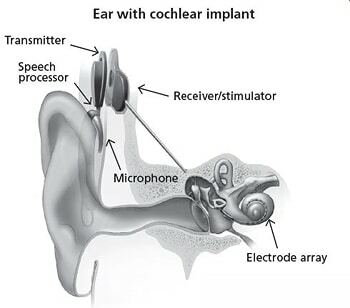 One example of this is being exposed to patients that have recently undergone cochlear implantation. One recent case triggered my curiosity about how often a patient might experience a vestibular injury, or some temporary vestibular symptoms, following implant surgery. This nice lady was doing well with her implant. She was in her sixties and hearing for the first time in years. About two weeks after the surgery, she woke to vertigo, nausea and disequilibrium. The surgeon asked me to see her that same day. On arrival, she had spontaneous nystagmus following Alexander’s law, beating away from the implant side. This pattern would be interpreted as a likely recent reduction in function of the labyrinth in the implant ear. This pattern is most often the result of a viral inflammation of a branch of the vestibular nerve that connects the inner ear to the brain (a condition known a vestibular neuritis) . The patient had no prior viral symptoms, and it would have been awfully coincidental to occur two weeks after surgery. Her rotary chair on that day also suggested a recent reduction in labyrinthine function on the implant side. A recheck one week later showed improvements in all of the above, including her symptoms. Several studies measured caloric responses on the implant side, both pre and post surgery. Reports indicate that there is a measurable reduction in caloric response in about 30% when averaging these several studies. One study also looked at changes in rotational chair results and saw reduction in VOR response in about 30%. In a small study, cVEMP responses were reduced in 40%. Subjectively, these changes don’t always translate into significant or prolonged symptoms. Some studies showed a significant increase in complaints of dizziness shortly after surgery, while one large study showed no change at 4 months post-surgery. It seems that patients undergoing cochlear implant surgery might benefit from counseling that changes in vestibular function are not unusual, may cause some temporary symptoms, but are unlikely to have lasting effect.